Experience a new kind of footwear. 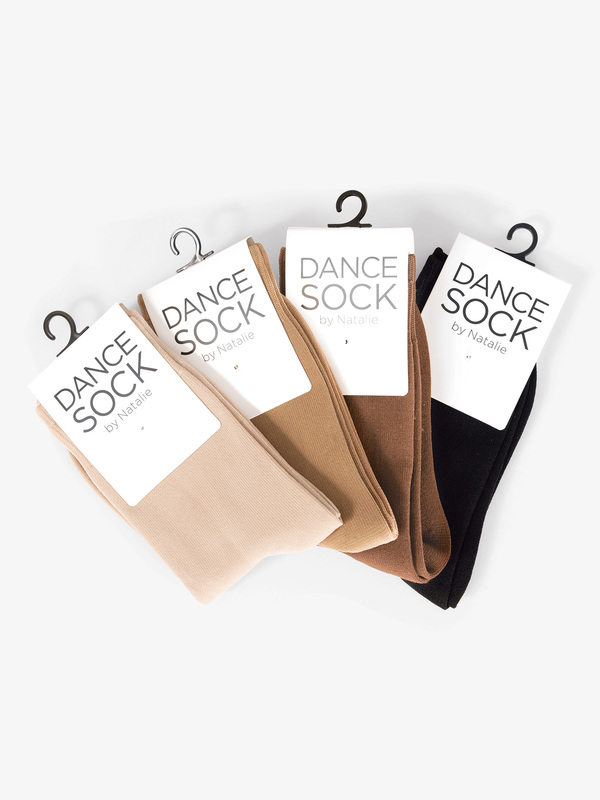 Designed by dancers for dancers, the industry's #1 dance sock features barely-there, lightweight fabric that allows the foot to breathe, prevents unwanted blisters and cuts, and keeps your toes from sticking to the floor for flawless turns. Its seamless construction and light compression creates beautiful clean lines, and makes it perfect for wearing alone or under shoes without any slipping or bunching. Also perfect for classes, conventions, or warming up the feet before class. Now available in four beautiful trending neutrals. Suggested Fitting: One size fits most. These socks feel great but are WAY too slippery for the stage. Judges repeatedly gave us feedback to get better socks. I got a color medium in these socks. The fit and shade is perfect for my tanner skin. I love that the socks actually fit my leg, as I ordered socks that are very similar to these, and they were loose on my leg. I also NEVER slip in these socks, and I spent about 15-20 less on this pair than I did on a pair of similar socks! Love these and so excited to continue to use them! Hello! Not sure what Polymide is, is that material slippery for parquet dance floors? Polymide is a stretchy synthetic fiber such as nylon. We can not guarantee how slippery this socks will be a specific floor.